Last week we had a couple of days away in North Devon in the resort of Ilfracombe, just 2 hours drive from here. We booked a pleasant B&B (busman’s holiday for us) but thought a change of scenery would be good. Unfortunately the weather was against us. The first day it rained constantly all day, but we decided to make the best of it and went for a walk to see the sites. The tide was out, the coast line very rugged. Unperturbed by the weather we ventured forth with our brolly up. We walked down to the harbour to see the boats. At the end of the quay stands “Verity” a 66 foot high statue of a naked pregnant woman standing on law books and holding the scales of justice behind her back in one hand, and a sword held high in the other. It is by Damian Hurst and to my opinion quite grotesque. I think it is something that divides the locals in opinion. One side is the outer body and the other side is the internal view!! After a nice breakfast is our B&B the next day we set off to the “Tunnels beaches”. Tunnels were dug out by Welsh miners in the Victorian era to provide a way through to the beaches, one for women and one for men, and the Victorian bathing pools. The time of our visit saw the tide up so we couldn’t see the bathing pools but we did go through the tunnels. We went down onto the women’s beach and Neil took the opportunity to skim some stones, something he is very good at. On the way back we stopped off at the theatre, known locally as “Madonna’s Bra” due to its large conical turrets. It would appear they have a wide and varied programme of events there. 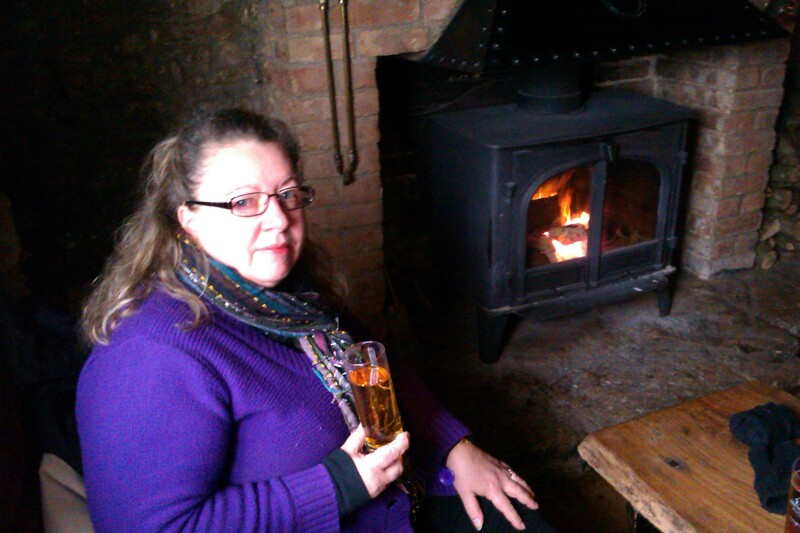 As the weather continued to be inclement we decided to head for home early and came back to lunch in the local pub “The Candlelight” in Bishopswood and very nice it was too. 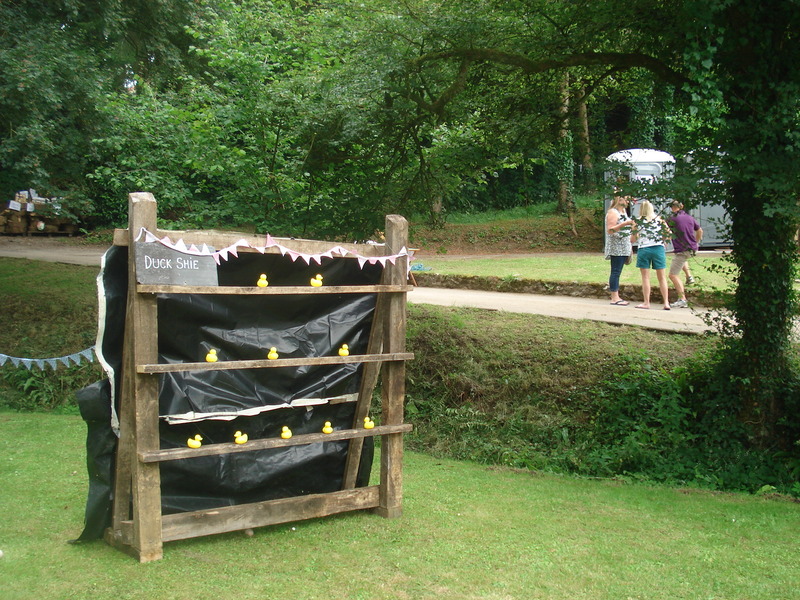 Today we went to the duck racing at Mill Leat in Bishopswood. 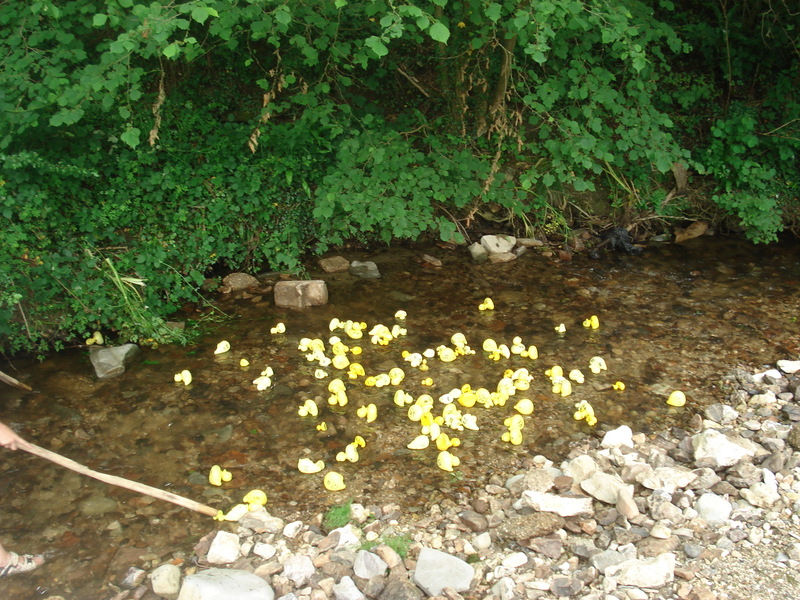 Not real ducks I hasten to add, but little yellow plastic ducks all numbered and tipped into the Yarty river. We had to buy a ticket with a number on, and then that was the number of your duck. We followed their progress down the river. Some got caught on stones along the way and had to be guided off. One would dash past and then another would overtake. The organiser had a loud haler and was calling out their progress. There was money to be won on the duck first past the post. 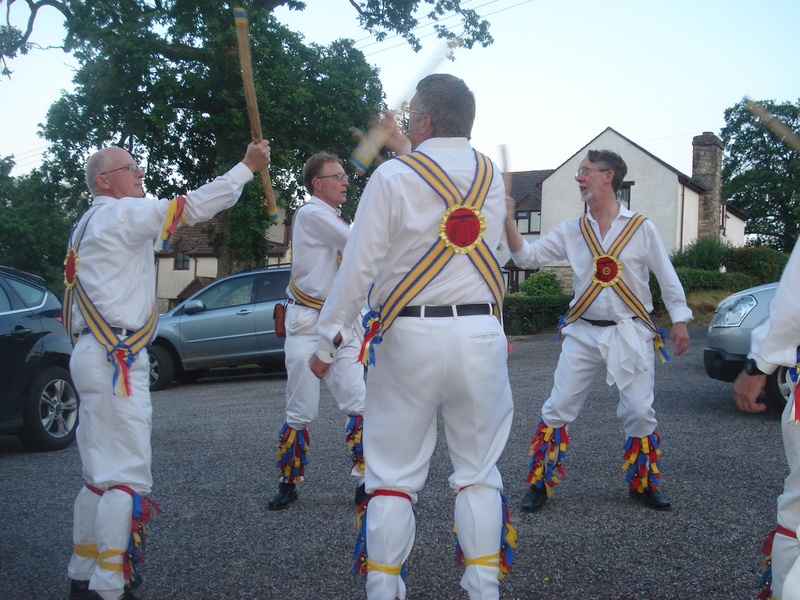 We didn’t win anything in any of the 3 races, but it was a bit of fun, a bit of madness on a Summer’s afternoon. 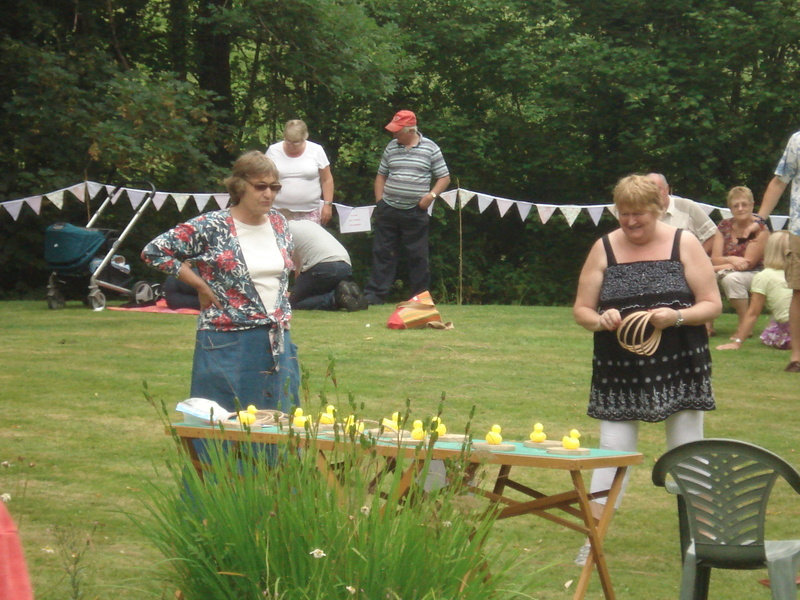 There were also other duck themed activities. Instead of a coconut shy there was a duck shy. Neil’s sister was with us and she knocked down two ducks. Then she had a go at throwing hoops round ducks. There were other duck stalls too and some people even dressed in duck costumes. The face painting for the children was ducks on their cheeks! 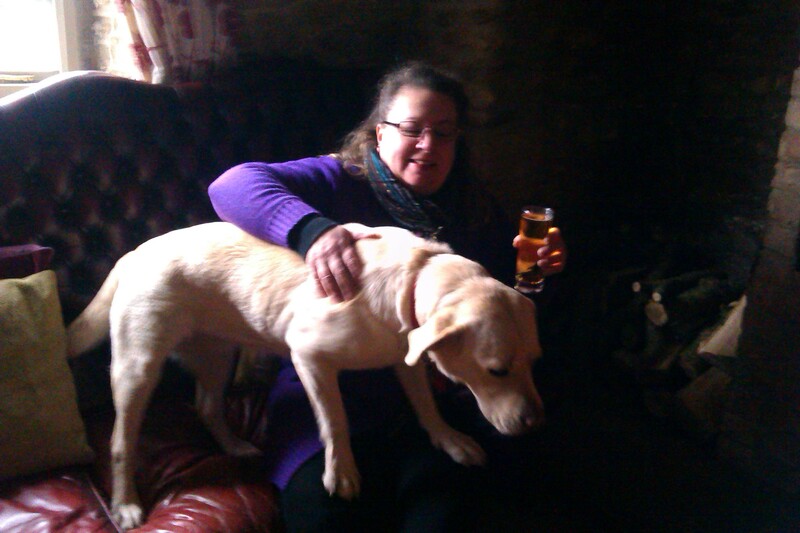 But we rather more sedately retired with a Pimms! 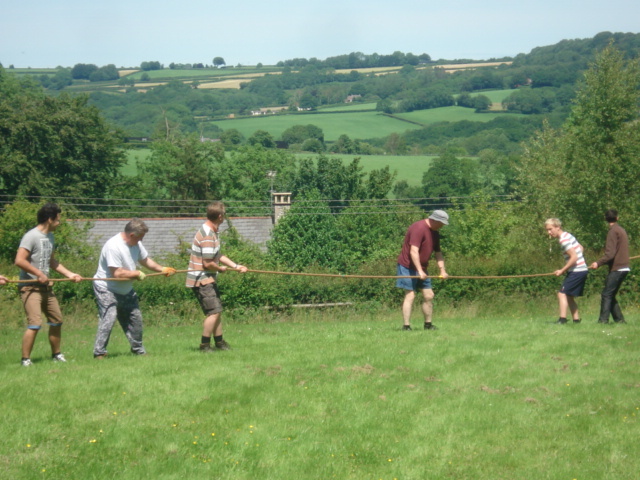 The last thing was the tug of war between Bishopswood and Buckland St Mary. Neil was in the Buckland team and went prepared in boots and gloves, but they still lost! 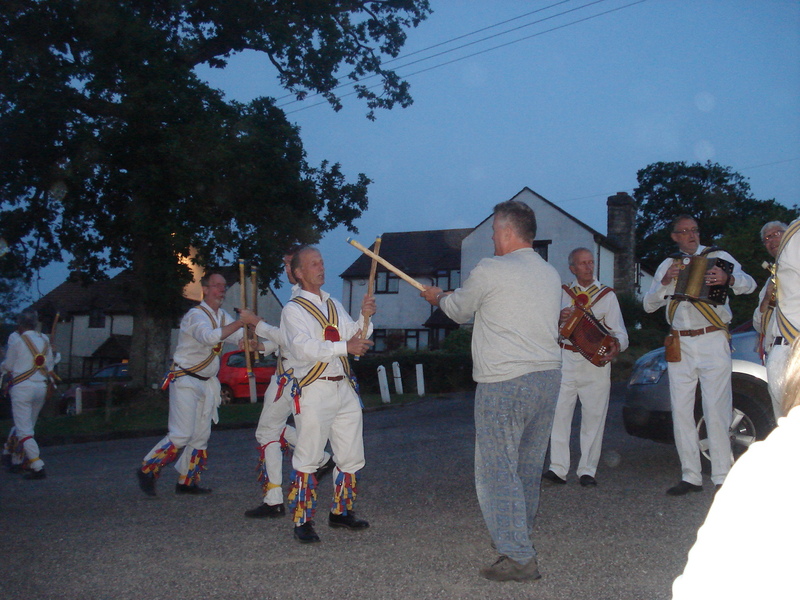 You can see the lovely thatched house in the background, in whose grounds the event took place. They are going to try and make it an annual event. It was well supported and everyone had a bit of fun. 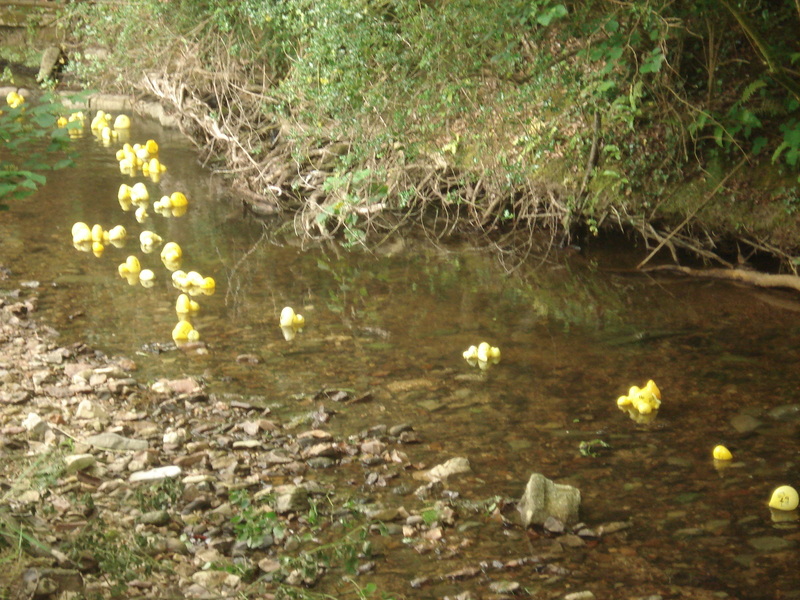 Other villages hold duck races too so maybe its just a local thing around here. We certainly had never heard of it until we moved here. 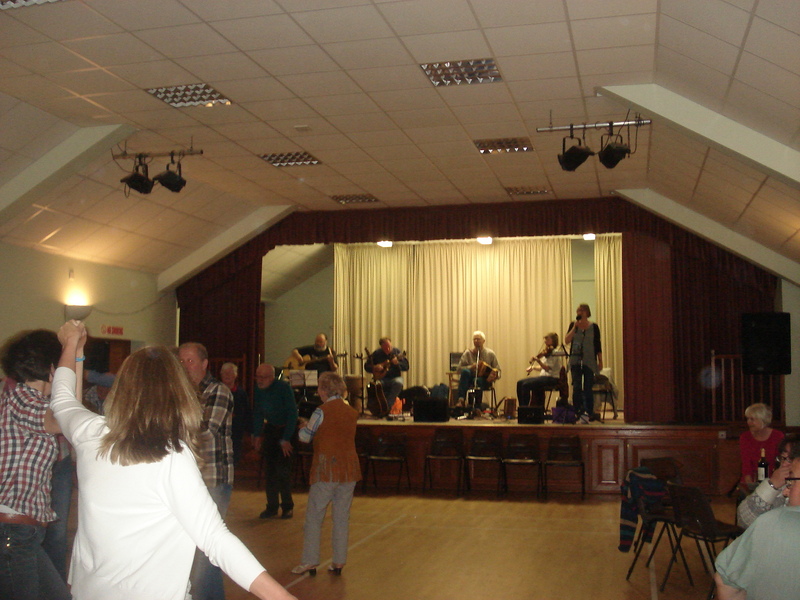 Bishopswood village, which is the next village to us, organised a barn dance for the May Bank Holiday. 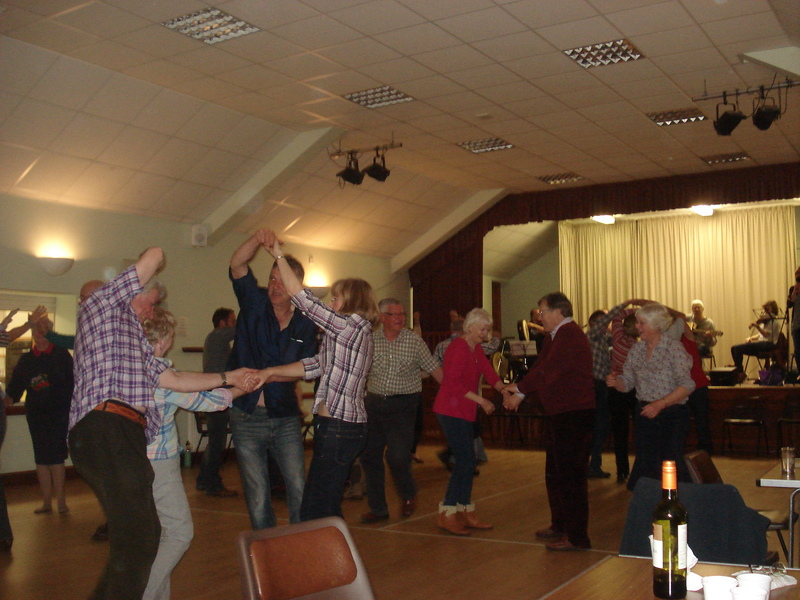 There was a ceilidh band for the occasion and tickets included a generous Ploughman’s supper and apple pie. 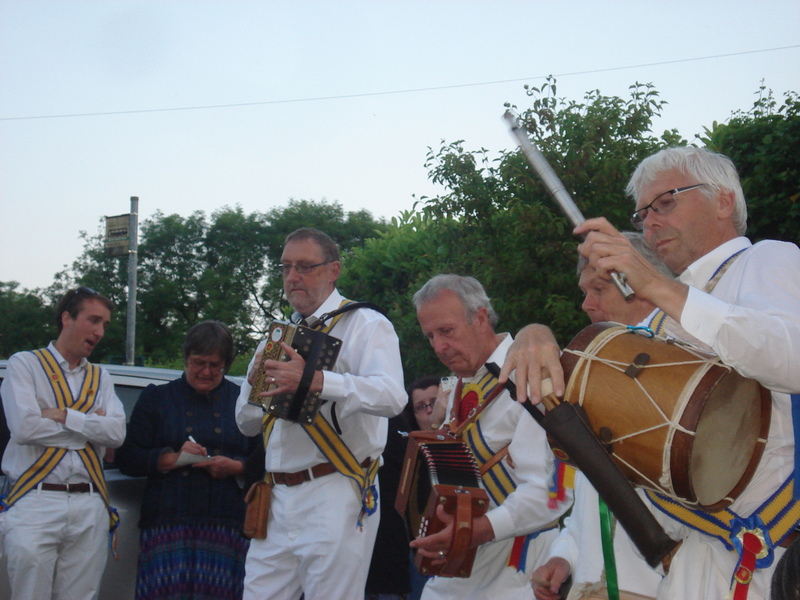 It was well attended by locals from the surrounding villages and although some of the dances tied us in knots, especially one called “wringing the dish cloth”, we greatly enjoyed ourselves. They are trying to make this an annual event now, which is a good idea as it is popular. It is important to support events in the local community otherwise these things don’t happen!! 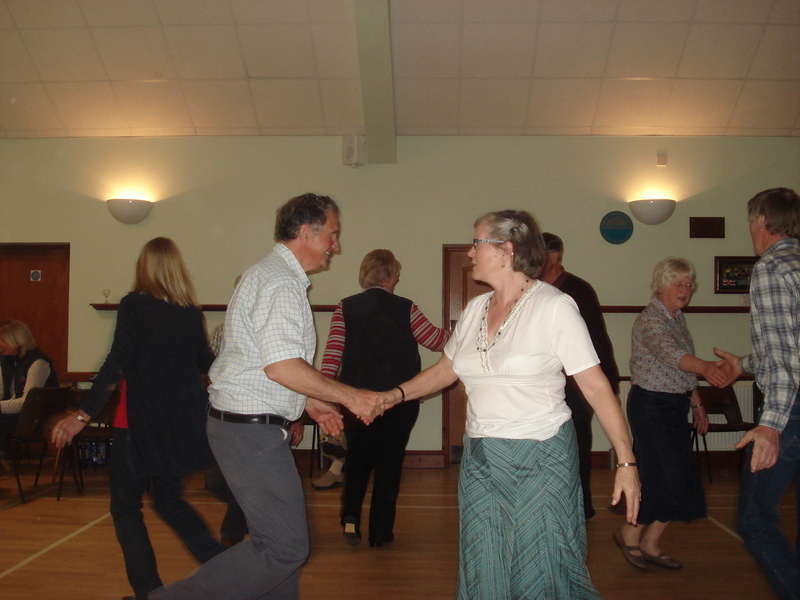 We also sometimes go to Churchinford village hall for barn dancing on a Tuesday evening which is a regular session but they don’t get so many people there as at this one. 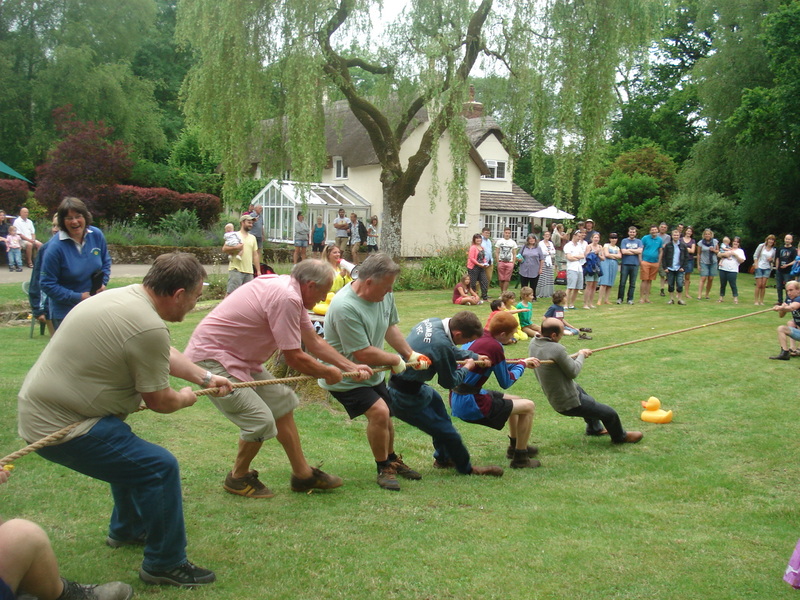 Yesterday was the now annual inter-village tug-of-war between Otterford (which encompasses Bishopswood) and Buckland St Mary. It was a glorious sunny day so we were lucky in that department. 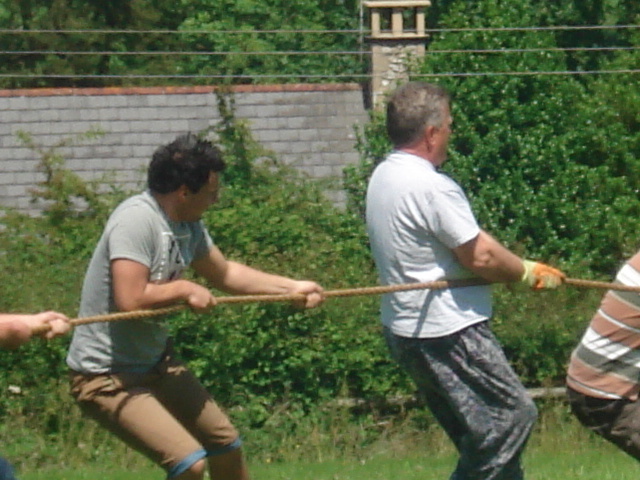 Unfortunately there was also cricket going on in Buckland so some people didn’t turn out for the tug-of-war and the Buckland team were a bit short on the ground. Neil went along and eventually they just evened the teams up with the men who turned out to make it fairer. Neil was sensible enough to wear gloves so he had could contact with the rope. The position they had chosen to do the tug-of-war was on a slight hill and what kept happening was that the team pulling down hill always won. So in the end they called in a draw!! 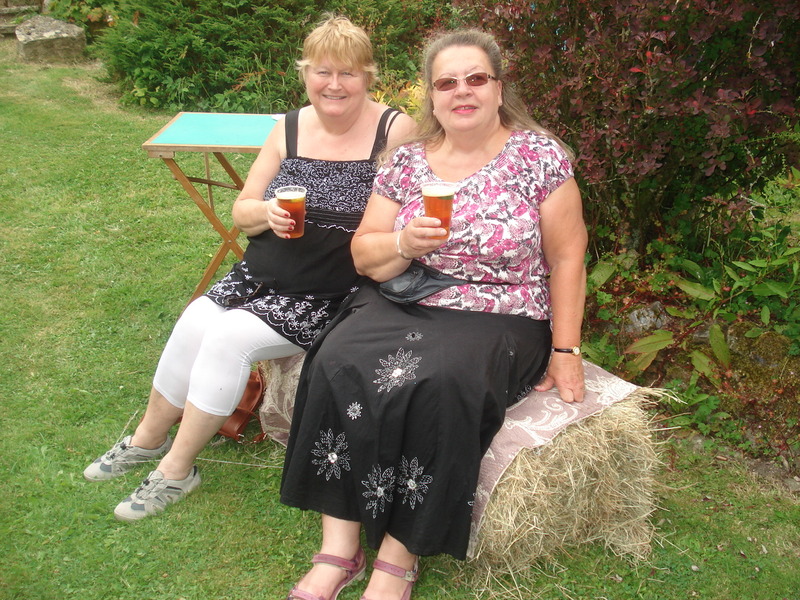 Then we sat on the grass in the sunshine having a BBQ and drinking home made elderflower cordial, lovely!! 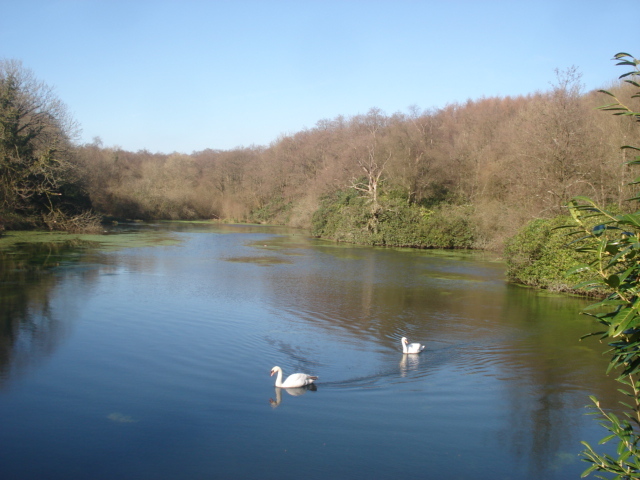 As it was such a lovely sunny day today, when our B&B guests had gone and we had the first lot of washing on, we went for a walk to Otterford Lakes. 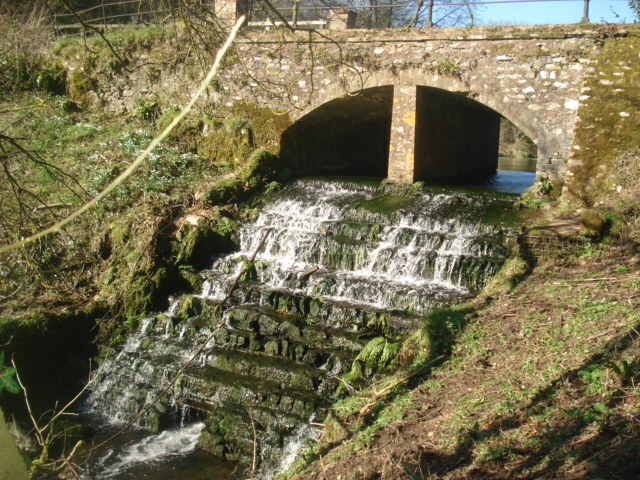 It’s not far from us, just up through Bishopswood a couple of miles. 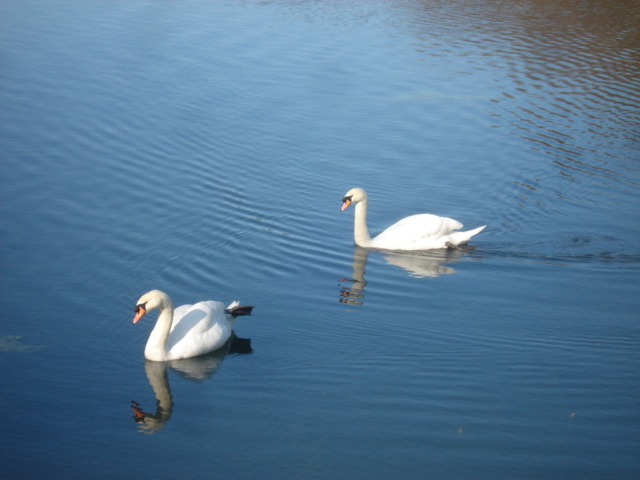 We walked down to the first lake and the swans were just gliding over the still water. As we stood and watched them they came nearer to us and I was able to take this close up. We took the lower path past the waterfall. 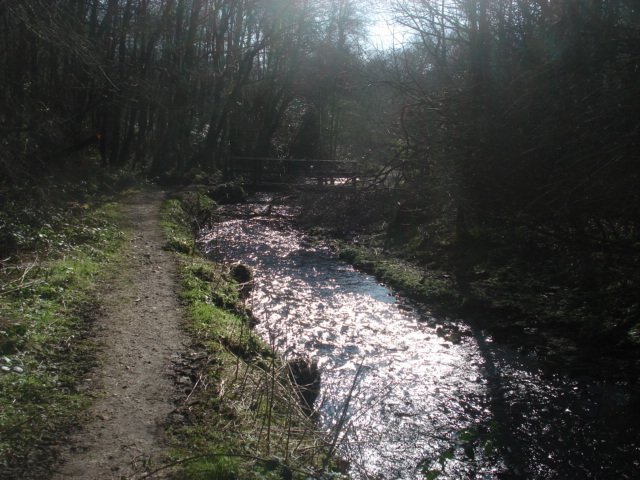 As we walked along the stream the sunlight was glinting on the water. 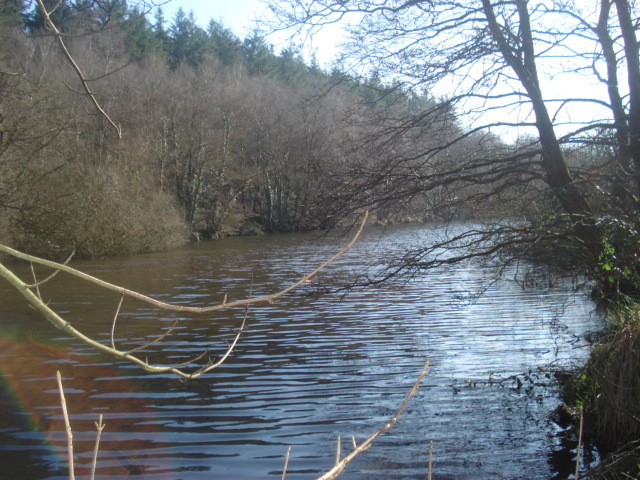 We followed the path along the stream until we came to the second lake. 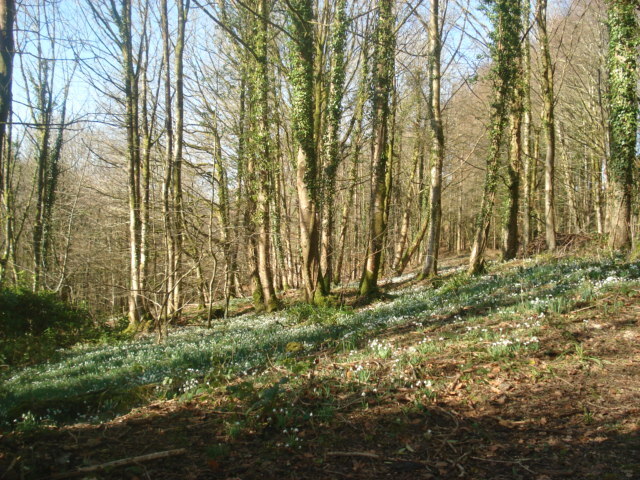 As we walked back we were able to the see the snowdrops much better. There were carpets of them in the woods. 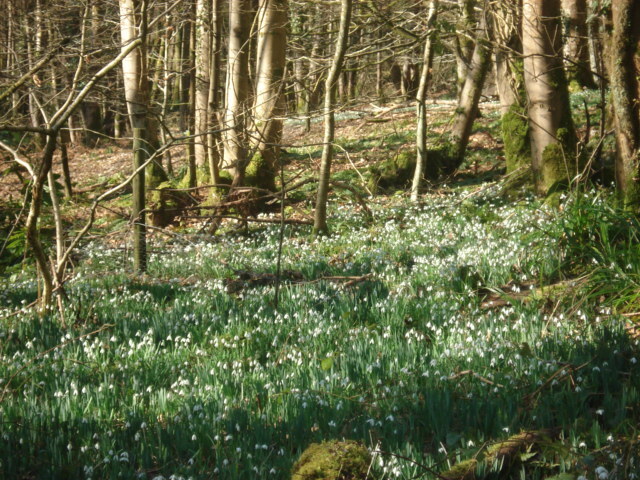 They looked so lovely in the sunshine, really made us feel like Spring is on its way. When we got home I noticed some of our Spring bulbs are bursting into life. 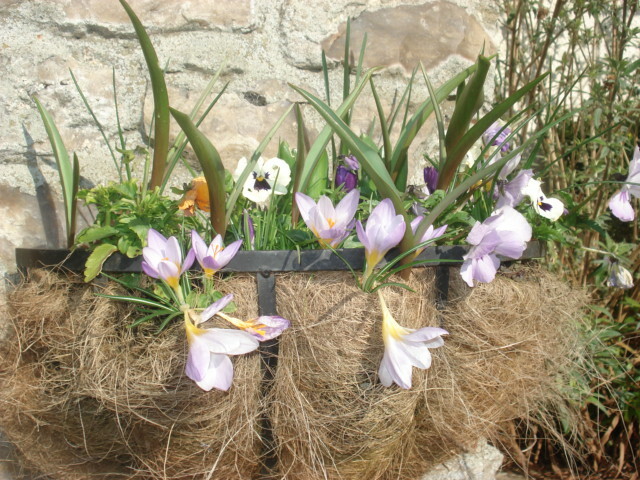 The crocus in the half moon baskets by the front door have come out. 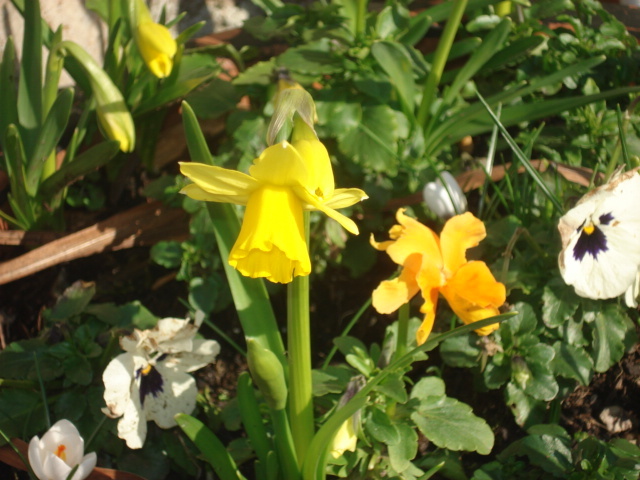 And the very first of the Tete a Tete daffs is out. We actually sat outside to have a cuppa after lunch the sun was so glorious. I think the B&B guests who left today were jolly lucky to have this lovely sunshine and to see the view from Lodge House so clearly, even in February.